Fridays are more fun at Merry Lea! Food Preservation: learning how to make the most of the Merry Lea Sustainable Farm harvest. The students practice canning, pickling, freezing, and drying. 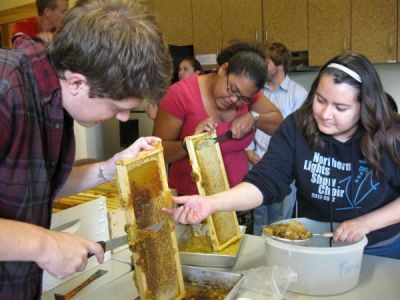 Beekeeping and Honey Harvesting: the students get a first-hand look at the sweet rewards that come from properly managing an apiary. Mmm-mmm! Wild Edibles: Nature produces an incredible bounty of deliciousness…you just have to know what you’re looking for. The students do now! Goat Shearing and Yarn Spinning: Teasel Hill Farm hosts us and shows us how to shear mowhair, wash it, dye it, and spin it. Many students now have the knit hats to prove it! 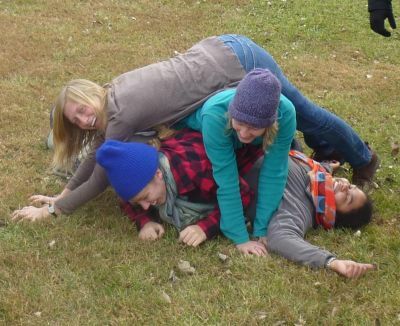 Minute to Win It: Sustainable recreation! Zany tasks to be performed with normal household objects. The catch is, they must be done in a minute or less. 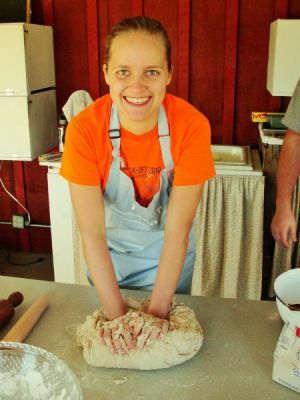 Breadmaking: Professor Jonathon Schramm shows us he has talents beyond teaching Environmental Problem Solving by leading this workshop on breadmaking. Hiking and Fire Starting: We start off the afternoon with a hike of Merry Lea’s unique glacial esker and floating vegetation mat, and finish it with a lesson on starting a campfire…and s’mores of course! Cheesemaking: Teasel Hill Farm is kind enough to host us again, this time to show us how to make fresh cheese in the home. We try our hand at mozzarella and ricotta. The above activities provide a great deal of fun and education. Often times, students even have a product to take away from the lesson (e.g. a jar of honey, a ball of yarn, or a braid of mozzarella). Most importantly, Fun Fridays are what the students want them to be. Come be a part of the SLS program and choose the sustainable living skills you would like to learn!